Employees are the cornerstone of your business. Learn how to lead them! I’m going to show you the four general categories employees fall into and how you can identify them. Also, I’ll show you how you can help each employee on their journey to the perfect employee. The ideal scenario would be that all your employees fall into the top right quadrant. But what are the chances of that? The best case is that your employees fit somewhere between the top two quadrants. And you’d be happy with that for sure. Yet, so many companies are in the situation where their employees are not engaged. They don’t understand or agree with management or the direction of the business. There is a natural law at play here. And it goes like this: people produce products or deliver services. Think about it. Even the most automated computer system you can find came from the mind of a person. A person produced the automated system. This is why productivity has to focus on the employee, and on the group. If your employees don’t turn up to work or produce bad products your company won’t survive for long. Let’s take a closer look at each employee group and how we can identify a person in that group. In quadrant 4 we have the “Whingers”. And as you can guess these guys have the least employee engagement of the group. I’m not going to sugar coat this because as a business owner you are hard enough to take it. If you have one “Whingers” in your team, watch yourself. They are like cancer, and will infect the rest of the team. It can be fast or it can be slow, but it is inevitable. No matter how well you encourage team dynamics you may find some employees in this group. And even the stellar employees can fall down if you treat them in the wrong way. What are the characteristics of a Q4 employee? Challenges almost all your orders. Produces bad products that need correcting. Takes little care on their own production. Seems to blame their bad production on other people or departments. Speaks in general terms, “they said”, “they feel”, “everyone says”, “we all think”. Hard to get into a positive conversation. Turns up on time and leaves exactly on time. Feels a degree of entitlement towards your company. Often found to be the real cause of a workplace argument. Even if they aren’t part of the argument. Can sabotage projects they don’t agree with. “Slags off” management to other employees. Tries to rally other employees and get support for their disagreement. Has a low IQ and is ignorant. Or has a high IQ and is vindictive. The above list is not exhaustive. I could list many more, and you could add a bunch of things from your own observations. But what can we do with these people? 2. Interview them and work out a personal development program. You should try and focus on developing the person where possible. Though you are going to have to make a call and weigh the options. 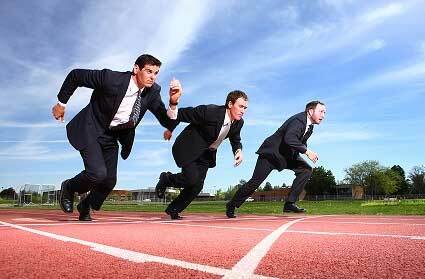 Would it take a lot of effort or distract from your broader company goals? It’s not an easy conversation to fire someone. But remember this, if you leave this “Whinger” in place they will infect others. One “Whinger” may become two or three over a year. Growing all the time. If left untreated your entire workforce could become antagonistic toward you. Pirates had this type of problem a lot. They called it mutiny. Avoid mutiny and take some proactive steps, right now. 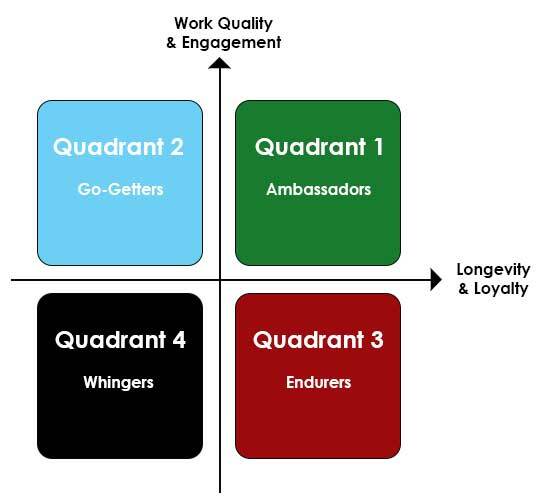 Moving up a notch we find the employee engagement a bit higher in quadrant 3 “Endurers”. Maybe not much, but it’s a brighter scene than the “Whinger”. I’d much rather take an “Endurer” over a “Whinger”, any day of the week. Why? Because even though their output is low, the do have a higher loyalty. In business loyalty is king. Because if you can rely on someone to do a task or achieve a goal you can focus your own attention on other things. What are the characteristics of Q3 employee? Been around for a long time, almost part of the furniture. Has no intentions of moving to another company. Produces low volume and or low-quality products. Turns up and just gets the job done. Will follow orders and direction. Acts like the “parent” of the group. Helps the younger team members when possible. Well, there isn’t a lot you need to do. You have a good level of loyalty from the “Endurers” and the do get the work done. What you should do is remember to acknowledge them when possible. Thank them for hitting a deadline and congratulate them on a good job, even if it’s not amazing. This group is easy to forget about because the other three groups take more attention to manage. But consider this “Endurer” group as your foundations. By looking after your “Endurers” they will help to spread loyalty through your team. Now, this is an interesting group. This group of “Go-Getters” produces excellent products and they do it fast. Yet the level of employee engagement isn’t much more than the “Whingers”. This is an exciting group. People in this category can help to boom your business and push the boundaries of expansion. Yet, don’t put too much reliance on them. Because doing so can lead to disappointment due to their flighty attitude towards companies. Let’s have a look at the characteristics of a Q2 person. A bright person with plenty of dynamic drive. Self-motivating and needs little external motivation. Needs to have their ego bolstered at every opportunity. Employee engagement is high, but comes with an element of risk. Produces great products and does so on-time. Can be self-centered and with a “whats-in-it-for-me” attitude. Driven by commissions, bonuses and mastery levels. Has strong opinions on everything. Has a tendency for rogue actions, if they don’t agree with management. Often just working to get experience and using you as a stepping stone onto a better job with more pay. The good thing about this group is that the get things completed. The bad thing is they will take almost every scrap of your management time to get the best out of them. While this can be rewarding because you are hitting your company goals it can also be draining. And even worse it can mean that you neglect the rest of the team. This group of “Go-Getters” isn’t engaged well and they don’t have a great deal of loyalty either. Also, they might just be using you as stepping stone to a better job. With this in mind, you find they are a little bit risky to have around. Yet, if you can manage them well enough they will speed your journey to success. This is every business owners dream, the perfect employee. This group produces awesome products on-time and you get the most employee engagement. While this group may seem to be unobtainable it should be your drive to create a team of this type. Here’s why you should aim for “Ambassadors”. Produce high-quality products and do so on time. They have an unquestionable loyalty and passion. Will follow orders without having to question them. Can provide unbiased constructive feedback on management directives. Fun to be around because they are happy. Employee engagement is high with the team and with their work. Will stay back late to finish a project because they care about getting the project results. But, doesn’t need overtime payments for it. They will bring a positive attitude and be the best example to the whole team. All actions contribute to the survival of the group. They care about everyone in the team and will often go beyond the call of duty whether you ask them or not. Because they care. So well connected to the group that anyone “talking bad” about the group feels like a personal attack. You almost can’t ask for anything more. While these “Ambassadors” are the holy grail of employees, they also come with a basic need. It’s not anything too outrageous. All they need is a consistent acknowledgment of their achievements. If you pay particular attention to people in this group you will have a positive group. You want to make this group so desirable to be in that other quadrants want to be in this group. This is tricky because you need to treat everyone in your team with a fair hand. But, do encourage a scene where this group is the goal of the rest of the team to be part of. If you want the most engagement, you need to put the most amount of effort into this group. The rewards are so much higher because you can make people happy and acheive your business goals. It’s true that we all have an ego, some are bigger than others but we all have one. Regardless of the size of your ego, you will know that you feel great when someone tells you that you did a good job. On the flip side to this, you feel pretty beat up when someone criticizes your work in a negative manner. So, to get a more engaged employee you need to acknowledge people for doing good work. Just find something to acknowledge them for because it’s going to work in favour. They might have produced an average product but delivered it faster than required. So let them know their speed was impressive. It doesn’t have to be a grand award ceremony. I’m just talking about a quick “thanks for your great work, Bob”. And all in earshot of the rest of group. People like to belong. Psychologists with their rudimentary vocabulary call this the sheep mentality. But whatever label we apply the fact remains people like to be part of things. And there is such a thing team dynamics. If a person feels the group wants him to be a part of the group he feels good. When he feels the group no longer cares for him, he starts to feel bad. So by validating someone in front of the group gives them an extra boost. It means so much more to them than the same thank you behind closed doors. 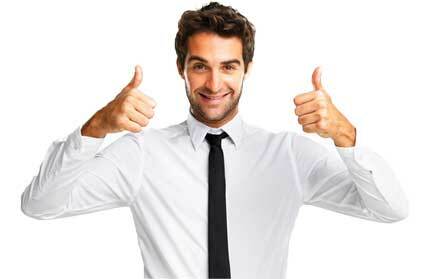 The validated employee will now work even harder for more praise. The rest of the group works harder because they want praise. You get more work from everyone. There is no silver bullet. Only hard work. If you want to become a good leader you have to realize it’s a journey, not a goal and it will take daily work from you. You just have to remember one key thing. The secret is this: without people, you have no company. So, focus on building great people and encouraging a strong team. You can almost forget about the products and concentrate on the people. 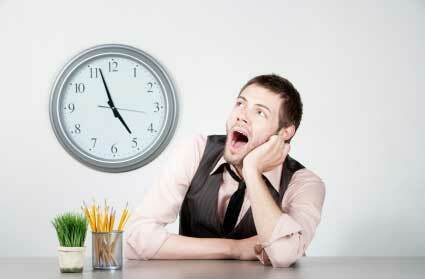 If you have high employee engagement the products should take care of themselves. When you have low engagement, production is a struggle. And anything produced is often low quality with customer refunds occurring often. Work with each employee to build on their successes. Find out not only what they do well, but also what they want to do. Regular interviews with the staff will help to keep them on a path. And make sure they have a path because it gives you something focus on as well as the employee. There’s nothing worse than working in a company without an end goal. That produces a team of robots. It’s a tough world, and leading a team to success is just as tough. Without you rolling up your sleeves and digging in your team isn’t going to be a success. Your team needs you. And your people need to know when they’ve done a good job.